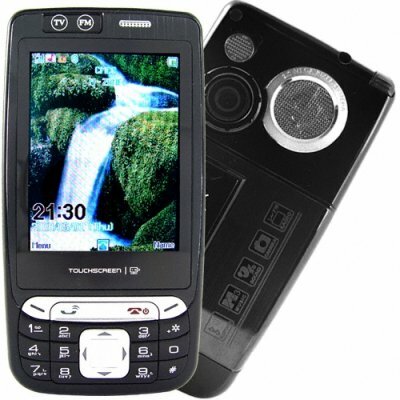 Successfully Added DVB-T 3.0 Inch Touchscreen Digital Cell Phone - Dual SIM to your Shopping Cart. DVB-T 3.0 inch touchscreen GSM/GPRS cell phone. Multimedia cellphone with Touchscreen, Bluetooth, Dual Sim, DVB-TV, FM radio, and optical zoom lens camera among its many hot features. The CVSCD-8500 is an easy to use mobile phone with its friendly touchscreen interface and well designed software. We had a good time testing this baby, and we are happy to say that this a fun mobile phone. But it is not just built for fun, it includes great messaging software, clear sound, and has the handy dual SIM slots for keeping in touch with business and personal contacts from the same phone. The internal microSD card slot already contains a 256MB card, so the phone comes out of the box ready to start taking pictures and loading up digital files. The box also includes an extra battery and a set of sharp earphones, meaning that weather you just want to an upgrade over your current phone or are buying this as a gift, all you need to do is open the box and you are ready for action! This is a great mobile phone at a low wholesale price, proudly brought to you by Chinavasion Electronics. Touchscreen cellphone with two SIM slots and 3.0 crystal clear screen. DVB-T! Do you live in Europe? You have a long commute or ride the train often? Then you will love watching beautiful digital TV on your phone while passing the time. Optical zoom lens camera; finally a mobile phone capable of taking high quality field pictures and video. NOTE: This product is compatible with the worldwide standard GSM frequencies of 900MHz and 1800MHz. Please check with your local provider if you are unsure of your local band requirement..
Works fine in your country.